Lately I've been on a cleaning-out binge, tossing away, giving away, and putting away all kinds of books, magazines, and bric-a-brac. I've got my dad's blessing to bring some junk to his basement so my sister and I can be ready for the town yard sale there this fall. I don't care if I sell the stuff or not, I just want it gone. 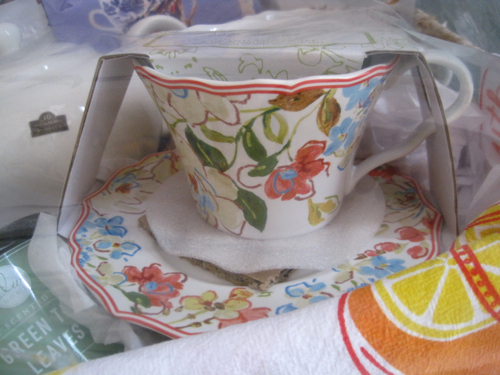 So I really, really think twice about bringing new stuff into my house (and my rule regarding teacups is that for any new one I bring in, I have to give one away, so expect some giveaways in the future, ha!). 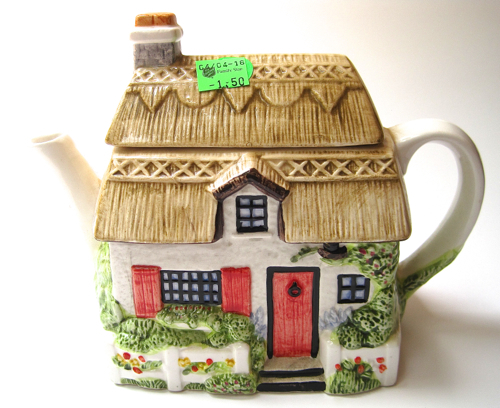 One area where I bend the rules, though, is when I come across something that's been on my "wish list," and Saturday at the Salvation Army in Carrollton, my aunt and I were shopping when I found a full-size cottage teapot like I've been wanting! Since it was just $1.50 and was in great shape, this definitely met a need. It wasn't marked except for a sticker saying Made in Phillipines. I don't recall ever having teawares from the Phillipines before, do you? The night before I hit the Salvation Army, I was talking to someone who wants me to help her with a big private tea on her property this fall. 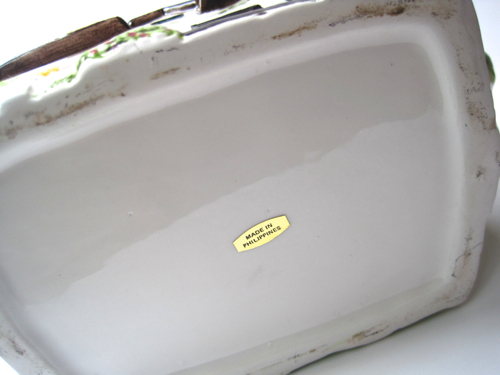 As I stood there pondering this fifty-cent handled dish, all I could think was, "Yes, and you'll be wishing you had this for lemon curd and cream come fall, won't you?" Since fall-colored teawares aren't that easy to come by, this got the nod as well. 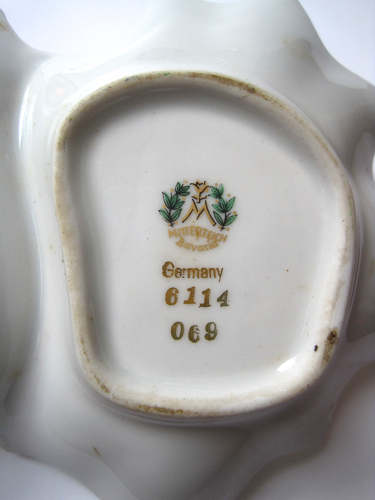 The backstamp says Mitterteich, Bavaria, Germany. I found a page regarding Mitterteich backstamps here, and I gather this piece was made sometime after 1920. Fun finds at the thrift store! While I never seem to make it out of the South very often, Boston, Massachusetts, has long been on my bucket list of places to visit. As much as I love American history, I think a tour of New England really needs to figure into my future before too many more years pass! • Oh, the fun of exploring the digital archives of the New York Public Library. That's where I came across this old but undated stereoscope image from the Oriental Tea Co.'s Store, located at 85, 87 and 89 Court Street in Boston. Can you just imagine wearing your long gown and fancy hat as you shopped for tea in such a store? Wow! • A couple of years ago, tea friend Jenn in Massachusetts was kind enough to send me a gorgeous little 1904 cookbook that was originally published by her Daughters of the American Revolution chapter there. 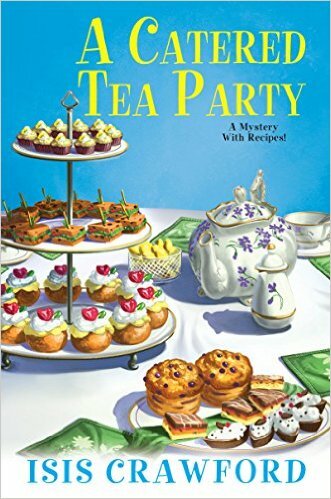 Titled "A Book of Beverages," the book includes (fittingly) a recipe for Boston Punch, which I was delighted to see lists tea as an ingredient. 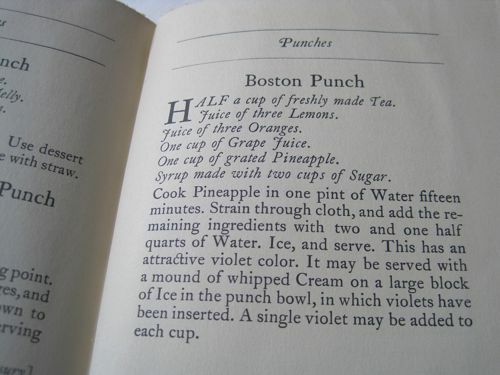 Last week I was thinking about "Lady Baltimore Cake" during my focus on Maryland, and this week, it's "Boston Punch." 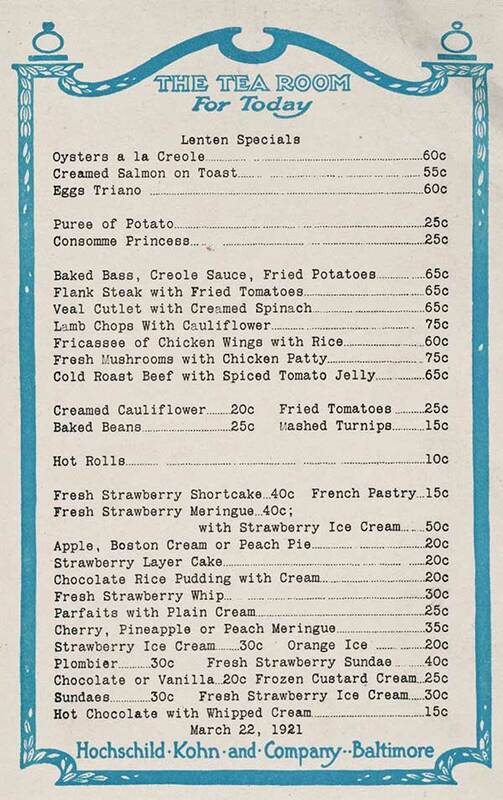 Wouldn't it be fun to research all the recipes named after cities in the US? 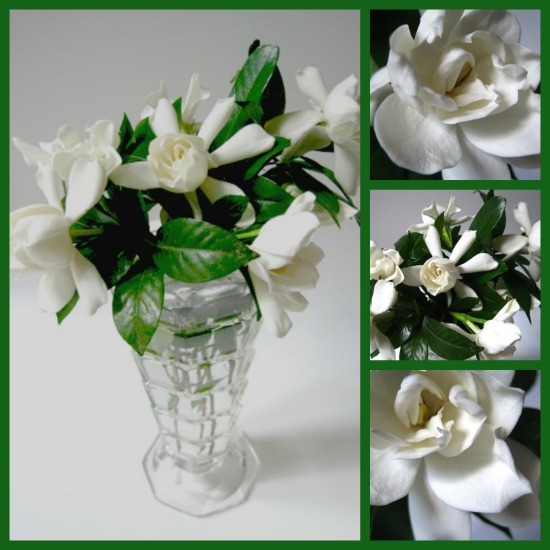 I don't often pick flowers to display in my Tea Room Depression glass vase, but this week the gardenias are in bloom, so I couldn't resist! These are especially prized flowers to me this year since, two years ago, this plant froze during an ice storm and was not expected to come back, but as you can see, it certainly did! And I think these flowers are worthy of displaying in my favorite vase. An Art Deco pattern, Tea Room Depression glass was actually used in tea rooms of the Depression era, but much of it was chipped because of the great number of corner angles. This pattern also shows a lot of "straw marks," which you'll notice in the second tier from the bottom. 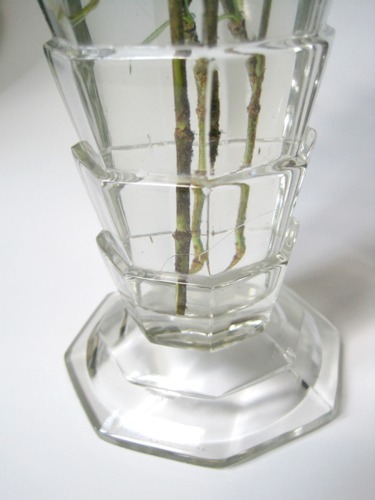 It looks like a crack in the vase but is not. It's simply a flaw that frequently occurred with this pattern. I haven't found any new Tea Room glassware lately, but the gardenias may have just inspired me to look! 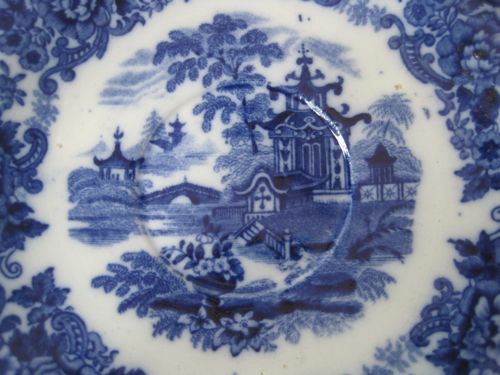 And of course what fascinated me most was learning that this pagoda-style tea house is said by some to have inspired the Blue Willow pattern, a saucer of which I've shown here. 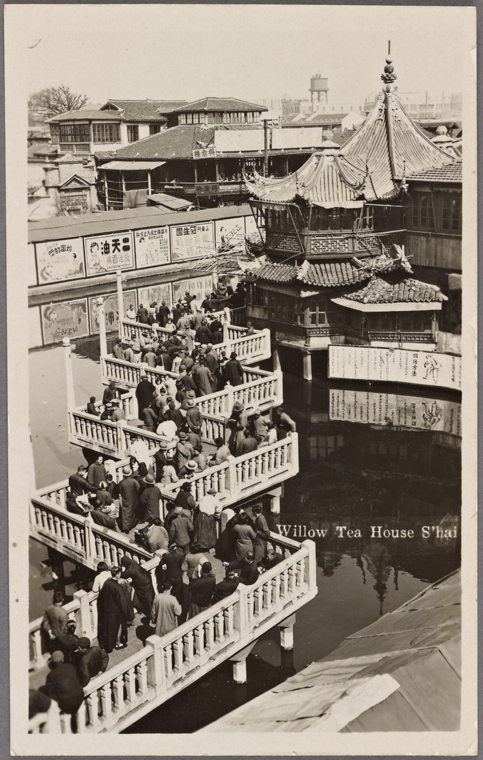 I may be the very last one in Tea Land to know this, but I had no idea an actual tea house was said to be the inspiration for the Blue Willow pattern! I enjoy sampling new teas like the ones Adagio was recently kind enough to send me, and when the tea is a loose tea, I also enjoy simply observing what the tea leaves look like. 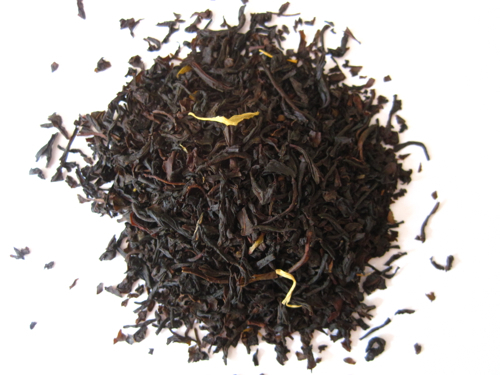 Can you guess what kind of black tea this is? I'll give you a hint and say the color and bits of fruit are significant. 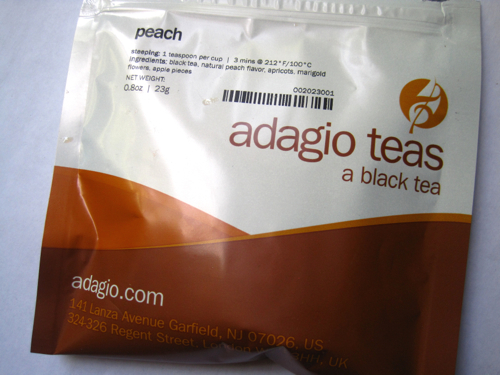 It's Peach Tea from Adagio, and I greatly enjoyed it! A good peach tea is a perennial favorite with me, and this one was full of the peach flavor I so enjoy. 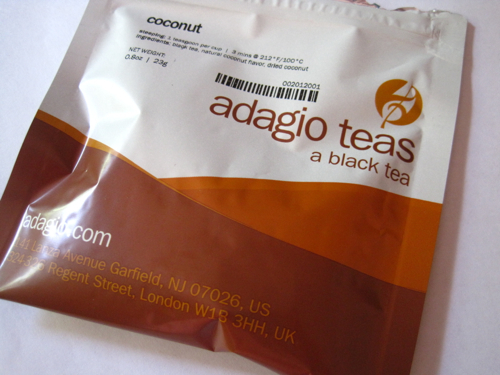 Coconut in the Coconut Black Tea! This was an almost creamy tasting tea, which I believe would make this an excellent dessert tea. Having enjoyed these two samples, I decided I'd pretend to be a tea blender and mix a bit of each for a Peachy Coconut Tea (or maybe a Coconutty Peach Tea?). Aristotle is quoted as having said, "The whole is greater than the sum of its parts," but I must tell you that was not true of my blend, because the "whole" blend was a blah-tasting tea in which I enjoyed neither the peach nor the coconut. Guess I'll let the experts at Adagio stick to the tea-blending from now on! Recently I was contacted by Atman Tea Co. about trying some of their organic and natural tea that was said to relax the mind and body. Goodness knows my mind and body could use some relaxation, so I said sure, I'll try it! 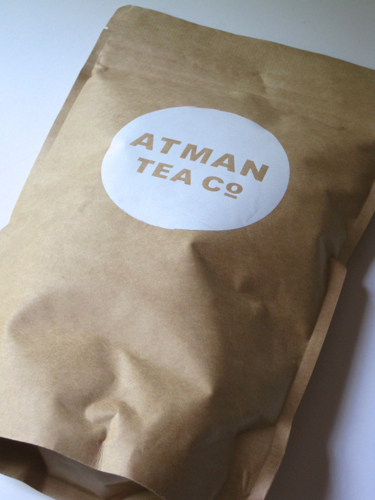 A package soon arrived in the mail, and inside was this packet with the Atman Tea Co. logo. I liked the look, but I wasn't at all sure what to expect inside. Now this is quite a different tea than I am used to sampling. 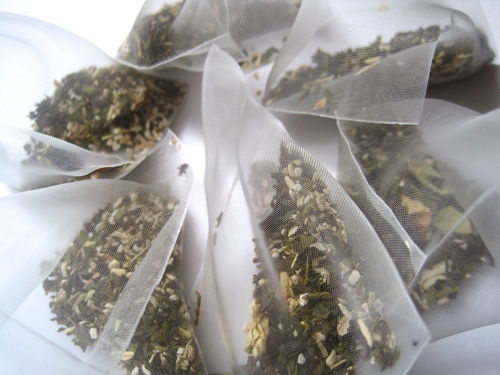 The silken tea sachets were lovely, and the tea inside looked intriguing. It's a blend of jasmine green tea and ashwagandha, said to be an ancient exotic herb from India and "especially useful for those who are exhausted, agitated, or drained by stress. It is also one of the most renowned anti-aging and rejuvenating herbs in Ayurvedic medicine." Now while I'm not exactly "drained by stress," I have been burning the candle at both ends lately, keeping up with all of my freelance writing and editing work while, perhaps ambitiously, keeping to my 1,000-words-a-day writing goal in order to finish my second cozy mystery—when I really ought to be editing the first! When I opened this packet of tea, my first thought was of Coppertone suntan oil. Even a whiff of that little coconut smell sends me back to the Florida beaches of childhood summer vacations, which is always a pleasant image. That's not *exactly* the right scent, as there was a spicy quality I can't quite define, but the Coppertone whiff comes close. This tea has a unique taste, sort of a zestier version of jasmine tea, and I rather liked it. This is not the sort of thing I'd want to guzzle by the gallon, but I sensed I was having a "spa" type tea, and that was a good thing. (I did read on the package that women who are pregnant or are on medications should check with a doctor, so please be advised of that if you're interested in trying this tea.) 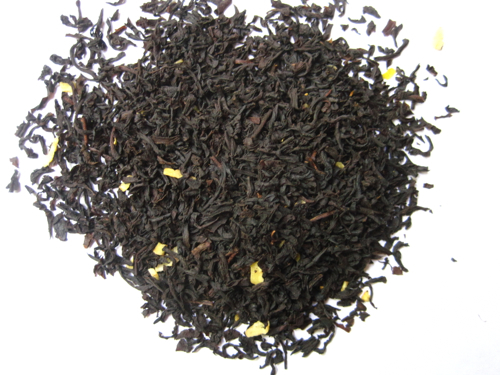 For more information, you may visit Atman Tea Co. here. Misty! I've just sent an email to the address you provided, and hopefully these will be headed your way soon. Thanks for entering, and congrats, Misty! I've heard the C.S. 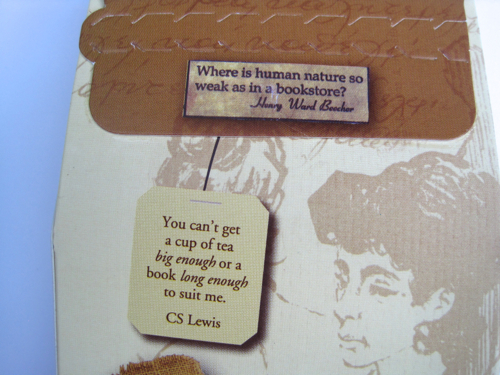 Lewis quote before, but I had not heard the Henry Ward Beecher quote, "Where is human nature so weak as in a bookstore?" Isn't that the truth! 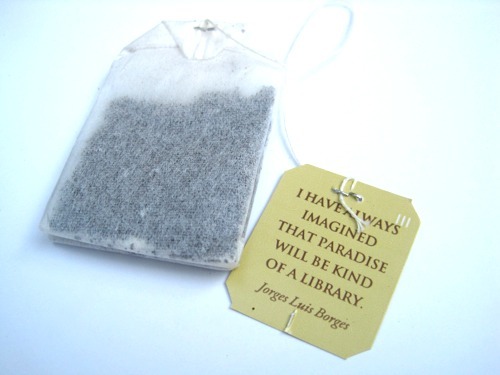 Each Ceylon tea bag (which makes a nice, brisk cup of black tea, by the way) has a quote attached, and I also liked this one by Jorges Luis Borges: "I have always imagined that Paradise will be kind of a library." (We book lovers can only anticipate what we'll be reading in Heaven one day!) So there are door prizes, and there are door prizes, and I must say I was thrilled with mine this year! • Baltimore, Maryland, was the home of the famous Hochschild Kohn and Company department store, and this 1921 menu from the store's tea room can be found in the digital collections of the New York Public Library. 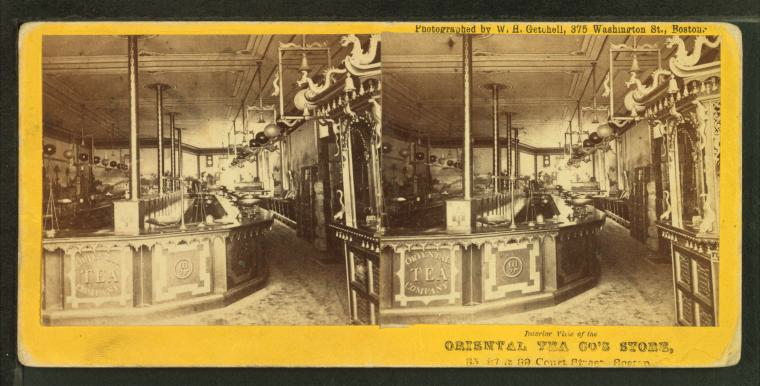 I love knowing what foods this old Baltimore tea room once served, especially the desserts! Boston Cream Pie, Fresh Strawberry Whip, and Peach Meringue? Yes, please! 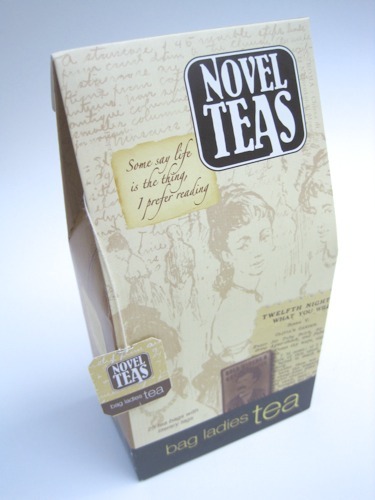 • One of the newer companies on the tea scene today, and one whose teas I have sampled and enjoyed, is Capital Teas. This company is based in Annapolis, the capital of Maryland, and I was pleased to read that the company has a rich tea history, as co-founder Manelle Martino is the great-great-grandson of Francis Van Reyk, "a tea entrepreneur who planted and oversaw some of the first Ceylon Tea estates (in what is now Sri Lanka) starting in the 1870s." 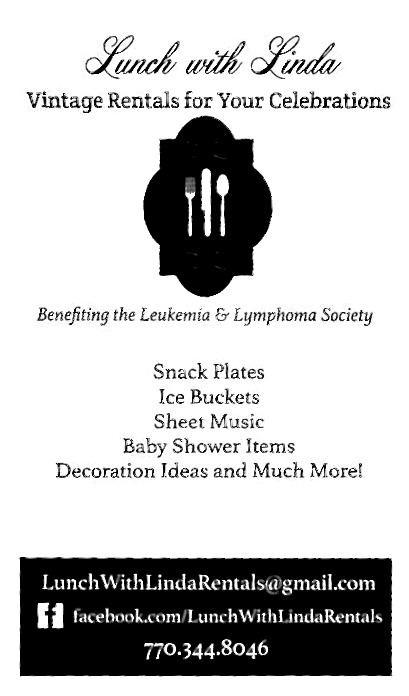 If you haven't tried their teas, you may want to visit http://www.capitalteas.com. • This vintage photograph from Greenbelt, Maryland, is another I found from the Library of Congress website. (Okay, so Washington doesn't mess up *everything* it touches, I guess.) It's from the Farm Security Administration - Office of War Information. 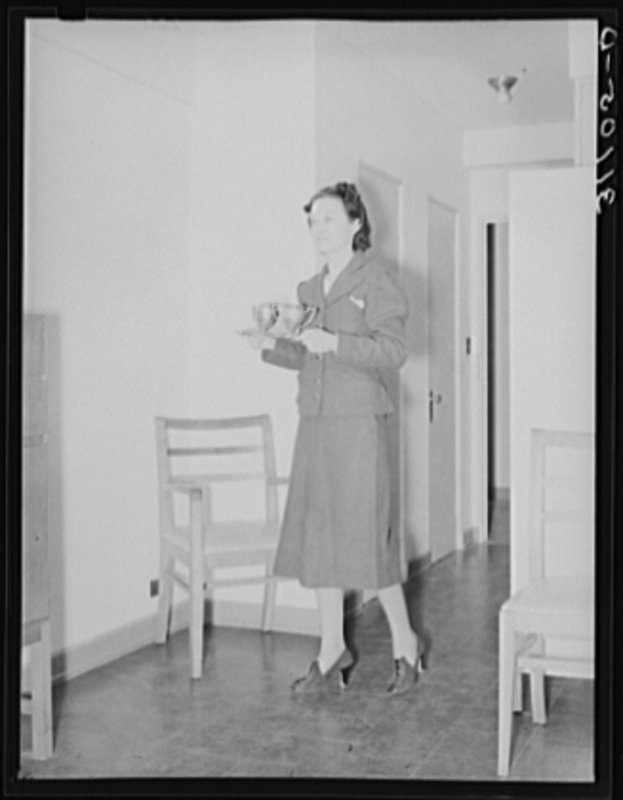 The photo from February 1938 is titled "Serving tea in one of the one-room apartments. Greenbelt, Maryland." 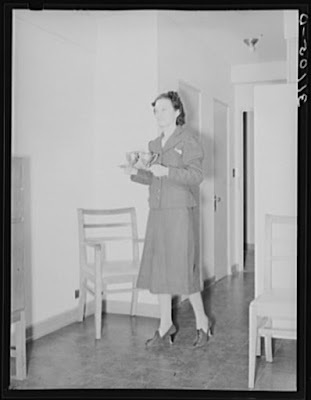 I'm intrigued that the "Office of War Information" photographed something related to teatime, so now I have yet another mystery to investigate, thanks to Maryland! May has been a crazy busy month for me, as I gather it is for many people at this time of year. With lots of social obligations, a huge editing project, and more, I feel I've had little "me" time, so I've been multitasking by coloring my way through the morning and evening news shows lately. 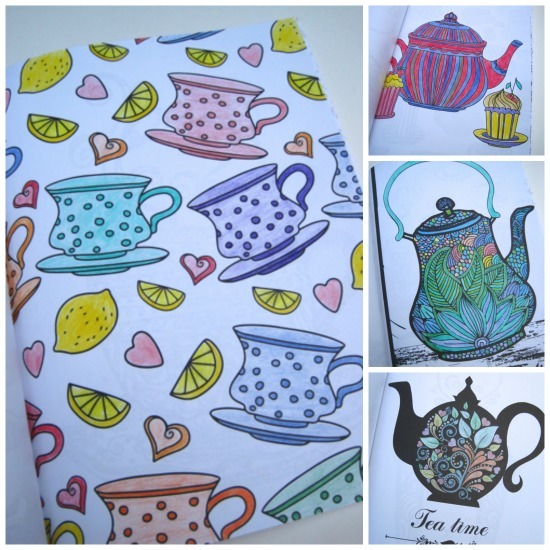 These designs are all from the new coloring book I wrote about here last month. This weekend I'm off on a road trip to the annual party of the publishing house I work for, and I'm definitely hoping to get in a few hours of coloring and relaxation along the way! 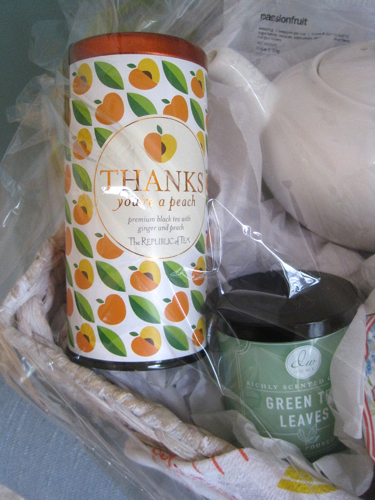 You'd think I would have done this before, but only this year have I started assembling tea-themed gift baskets. 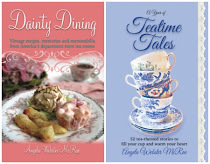 I'd seen other authors give away gift packages to promote their books, so when I published my "Teatime Tales" earlier this year, I decided that donating some tea baskets with a signed copy of my book to local charities I'm involved with might be a good idea. This is my third and latest gift basket this year (all destined for silent auctions), and it's one of my favorites yet. 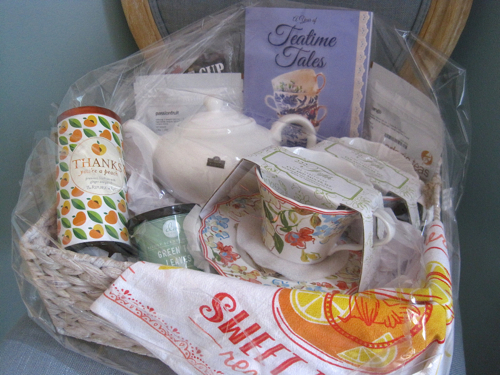 In addition to my book, this Tommy Bahama basket contains a tea towel, peach and other teas, a green tea candle, a white teapot, and two teacups. The basket also includes two 222 Fifth teacups. These are more contemporary teawares than my style, but this is aimed at a younger, hipper crowd, so I hope I guessed correctly about their tastes. 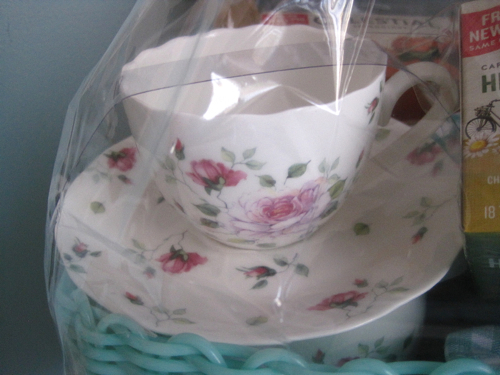 Earlier this year, I donated this gift basket to another local nonprofit, and again it included a signed book, tea towels, a teapot, and two teacups. 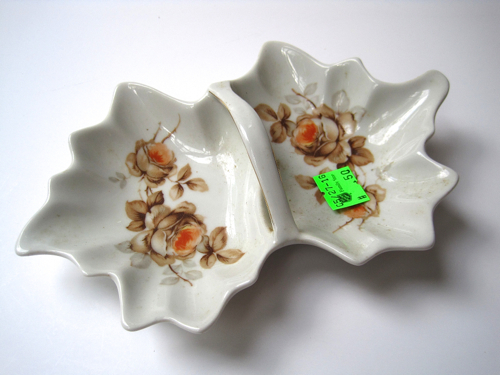 Now these were two teacups I absolutely adored, and if I'd seen one more, I would have gotten it for myself, but alas, that T.J. Maxx had only the two! But isn't this design lovely? I especially liked the scalloped shape of the teacups. Whether or not donating such items ever works as a "marketing tool" for book sales, I must say I have enjoyed finding and packaging these baskets while supporting local nonprofits. (And I failed to get a picture of the last basket, but it was different too. I don't think any two will ever be just alike.) 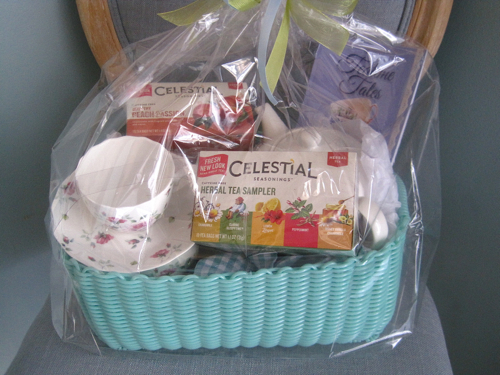 So I've learned that a plain teapot, two teacups, and some teas is a great basis for a tea-themed gift basket. I'm thinking an "adult coloring" basket with a tea theme might be fun later on. Do you have any ideas for tea-themed gift baskets? Well, I hardly know what to say about this! 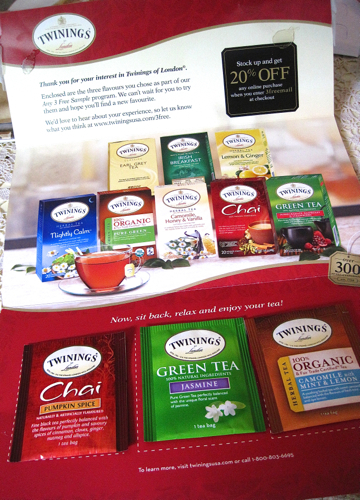 Some weeks ago, I shared here a link to an offer I'd seen online to request three free samples of Twinings teas. I'd done so before with happy results, and I was eager to claim three more freebies. 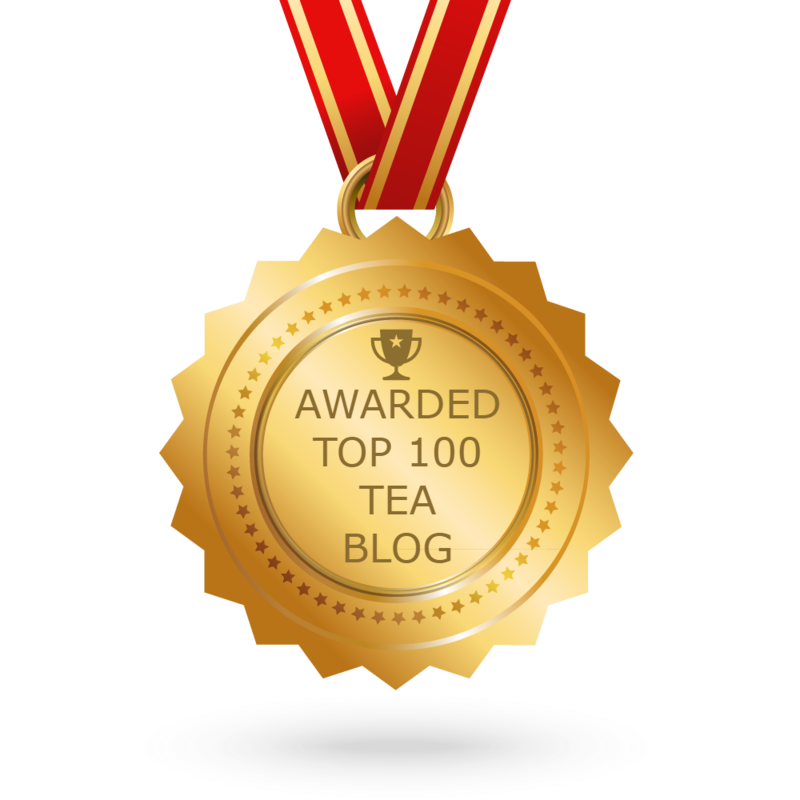 But in what is surely a first for this blog (and, I hope, a last), I didn't like any of them! Why? The Pumpkin Spice Chai tasted musty and old. I'm used to a brisk, robust pumpkin flavor like the Harney and Sons Pumpkin Spice Tea, and this Twinings blend isn't even in the competition. I wondered if it was just an old tea bag. The Jasmine Green Tea would surely be better. Meh. 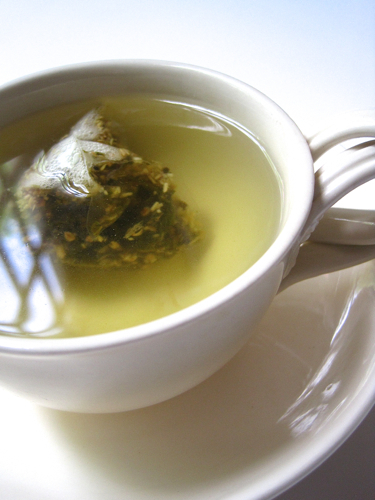 It was just a so-so green tea, drinkable, but with scant jasmine flavor. Nope. Finally, surely, surely I would like the Organic Camomile with Mint and Lemon, right? But no, this just tasted like plain old chamomile tea, with maybe a teeny tiny bit of mint but no lemon flavor. And I had expected I'd love this one! Are my tastebuds off? 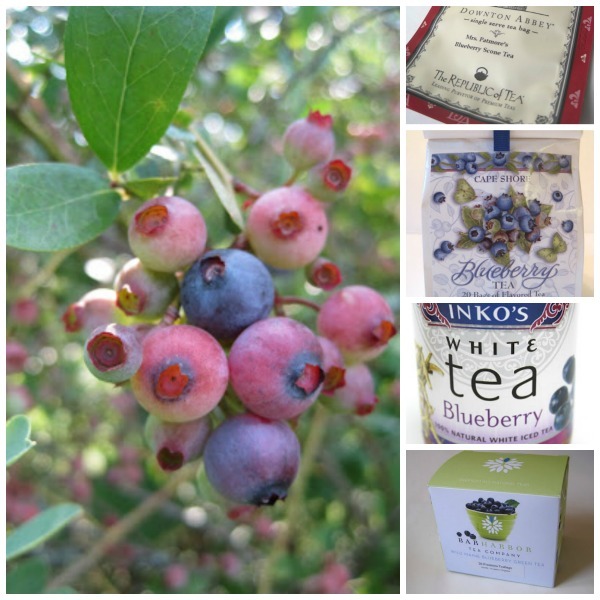 I think not, because I drank other teas that day that I enjoyed (including tea from a fresh box of a Twinings berry blend), just not any of these samples. Have any of you received yours? Did they taste old? I don't think I've ever said a negative word about Twinings, but I have to say these new samples left me wanting! I've said it before, but if I'm not editing a book or writing a book, I'm reading a book, and most days, I do a bit of all three activities. 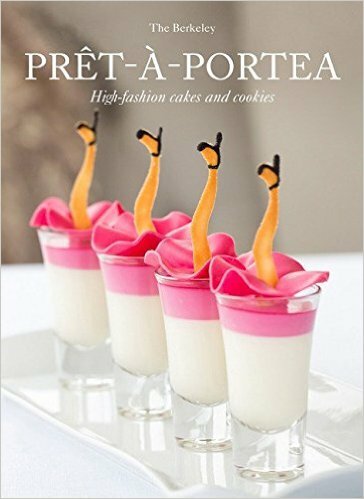 Occasionally, I go snooping on Amazon to see what new tea books are coming out in the months ahead so I can go ahead and add them to my Wish List! 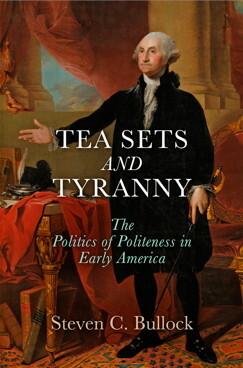 Among the ones I’m eager to read this fall is “Tea Sets and Tyranny: The Politics of Politeness in Early America” by Steven C. Bullock. “Politics” and “politeness” aren’t two words I would put in the same sentence today, so I’m very interested in a book that examines the role of social interactions that contributed to the coming of the American Revolution. “A Catered Tea Party” by Isis Crawford is coming this August, and it looks like just the sort of cozy mystery I’d like. 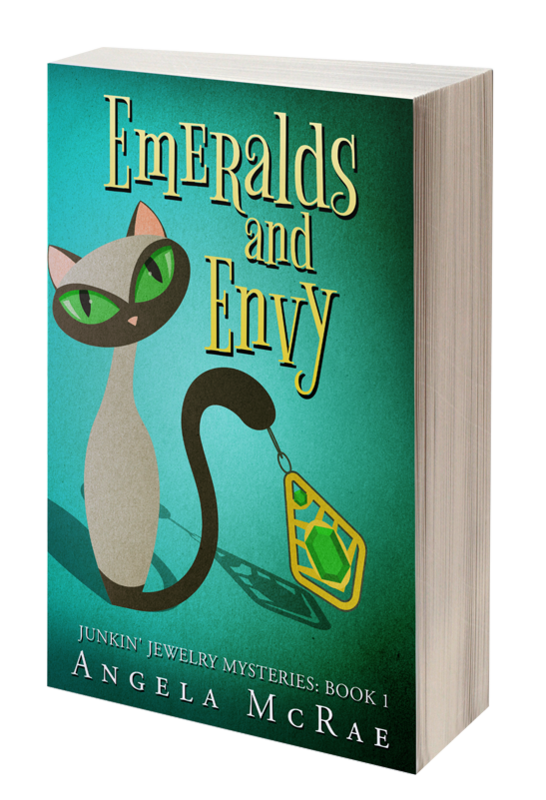 I haven’t read any of this author’s othered “Catered” mysteries, so if you have, please let me know what you think. 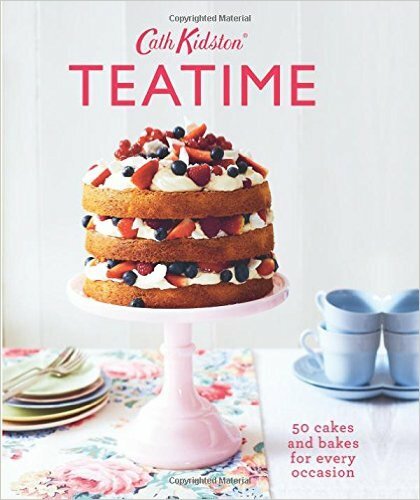 Now I’ve been a Cath Kidston fan for years, so when I saw she’s coming out with a teatime cookbook, I immediately placed it on my Amazon Wish List. This one comes out in September, and the preview on Amazon looks delightful! 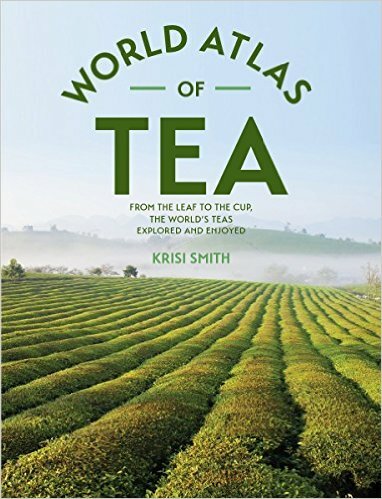 Also coming in October is “World Atlas of Tea” by Krisi Smith, which “follows tea from the plantation to harvesting and processing to how to make the perfect cup. The book is illustrated throughout with beautiful color photographs taken in the field." I love the idea of a "World Atlas" of tea and can't wait to read this one. 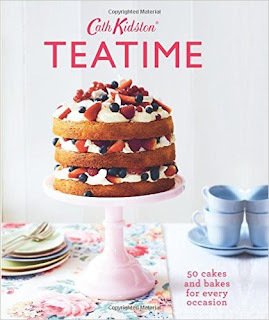 So what's on your teatime reading list these days? 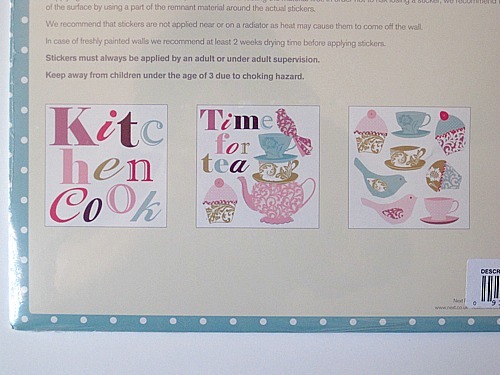 May giveaway: "Time for Tea" wall stickers! I'm always searching for some interesting new tea item for each month's giveaway, but it's rare that I come across something I've never seen before. 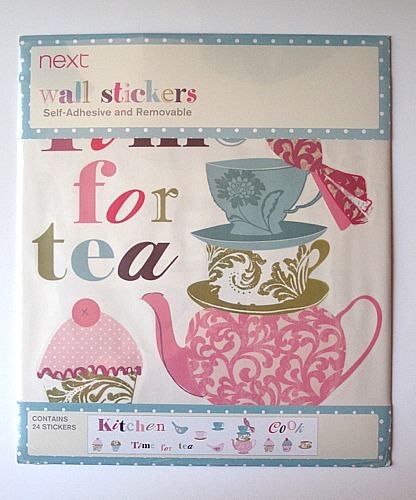 Recently, however, I found these self-adhesive and removable wall stickers at T.J. Maxx, and I decided they would be great for a giveaway! You could use them for a temporary decor for a tea party for yourself or little girls, or you could use them in your kitchen anytime, or if you've got a daughter or granddaughter with a tea-themed bedroom, these might be fun in there as well. I'd say you're limited only by your imagination! I didn't want to open the package, but the back does give you some ideas for different ways you can use these. 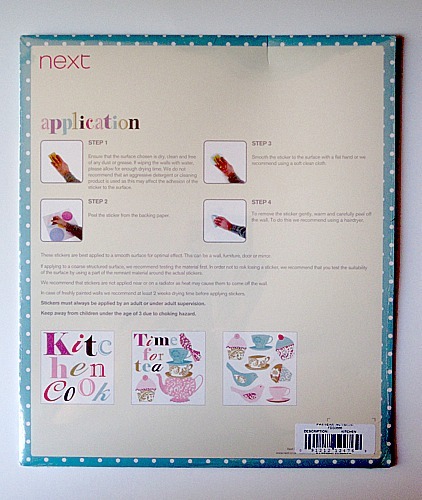 The stickers are from a company in the UK (next.co.uk), which is not really surprising considering the theme! And here's a closeup to show a little more detail. If you'd like to win these wall stickers, just leave an "Enter me" to this post by 7 a.m. next Monday, May 23, and you'll be entered to win. (US and Canada residents only, please.) Good luck! • Kennebunkport, Maine. I always think of that as the summer home of President George H. W. Bush, but in tearoom history, it was also once the home of the Old Grist Mill Tearoom. 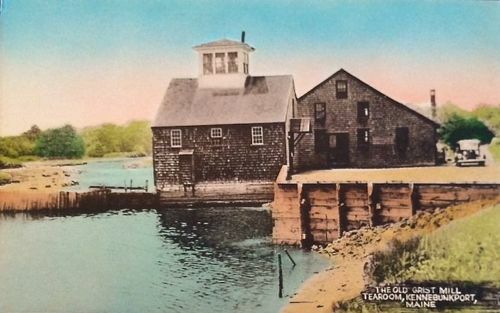 The restaurant opened in the forties and was owned by two generations of the Lombard Family, and it was an actual working grist mill that had been converted to a restaurant. The restaurant is no longer there because it burned down in 1994 "under suspicious circumstances." I'm thinking that would be an interesting plotline to explore in a mystery, don't you? 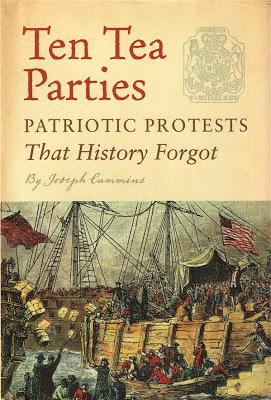 • Finally, I have to mention a fact that I did not know until a few years ago, which is that the Boston Tea Party was actually just one of a number of early "tea party" protests in our country. Ten of them are featured in Joseph Cummins's intriguing "Ten Tea Parties" (which I noted was on sale for just $5.98 in the discount section of Barnes and Noble recently), and one of them was in York, Maine. 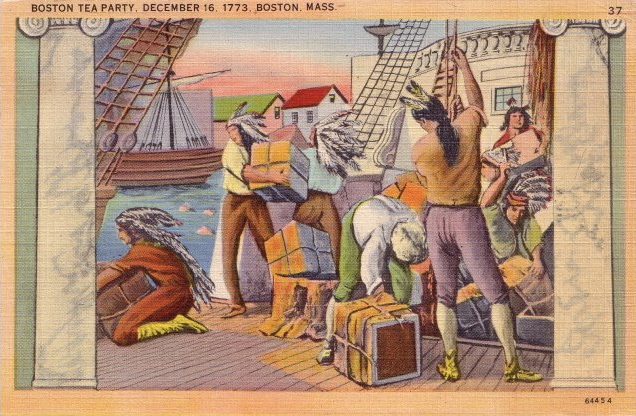 If you're interested in all the juicy details, as I always am, you can also read about the "York, Maine Tea Party of 1774" in this article. One evening this week, I was walking to the mailbox in the evening when a spot of peachy color in the front yard caught my eye. What is that? 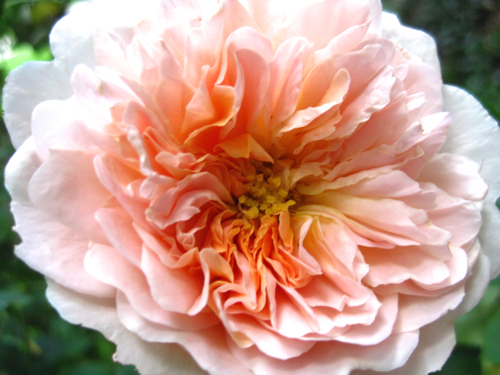 It was my 'Tea Clipper' rose from David Austin English Roses, which doesn't usually bloom until around Memorial Day! I absolutely adore this beautiful, fragrant rose, a birthday gift from my friend Deberah years ago. 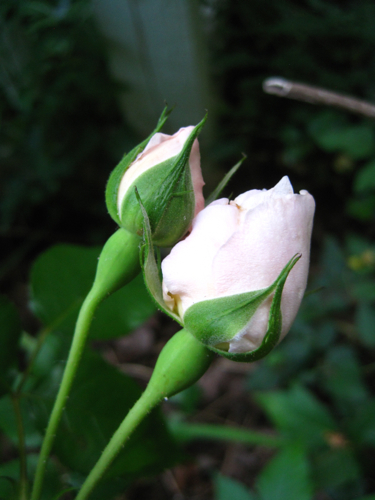 She also gave me a pale pink David Austin 'Wedgwood' rose, which will be blooming soon. 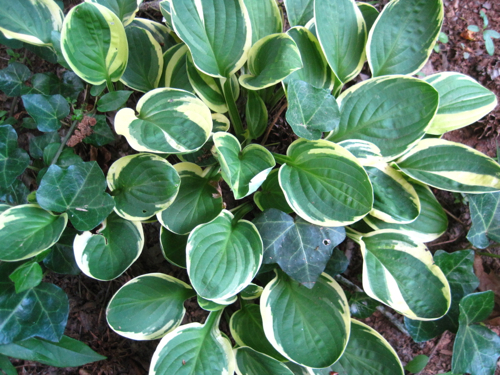 And this hosta obviously isn't a David Austin rose, but I'm still so happy my 'Tea and Crumpets' hosta has come back to life. The deer munched it to the ground last year, so I'm keeping my fingers crossed that I'll be able to enjoy some of these garden treasures for a bit longer this year! 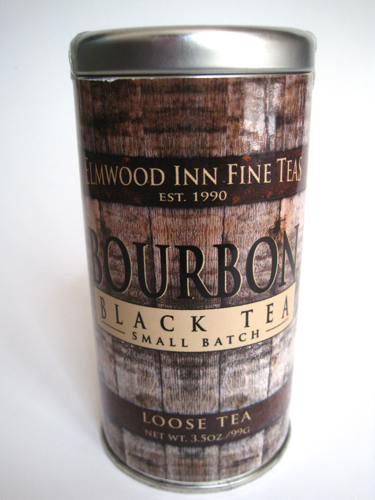 This tin of Bourbon Black Tea from Elmwood Inn Fine Teas in Danville, Kentucky! I had been wanting to try this tea, even though I've never had a sip of bourbon that I'm aware of (unless chocolate-covered bourbon balls count). You'd think a boring, middle-aged teetotaler (or teatotaler?) wouldn't be interested in bourbon-flavored tea, but I was, and since the bourbon in mint juleps is synonymous with the Kentucky Derby, this tea is the perfect tea lover's tea to enjoy on race day! I'm happy to report that I really, really like this tea and have been drinking it all week. (There's no alcohol, so don't worry that I'm turning into a lush!) It has a smoky edge and an almost sweet quality that I greatly enjoy, almost as if somebody finally got the recipe exactly right for that Lapsang Souchong tea I find so offensive. So I'm enjoying my new bourbon tea very much, and now I don't have to wait a whole 'nuther year to get in Kentucky Derby mode again! Note: If I'm about to review a new tea, I try not to read about a tea's ingredients until I've tried it so that I won't be influenced by the description. 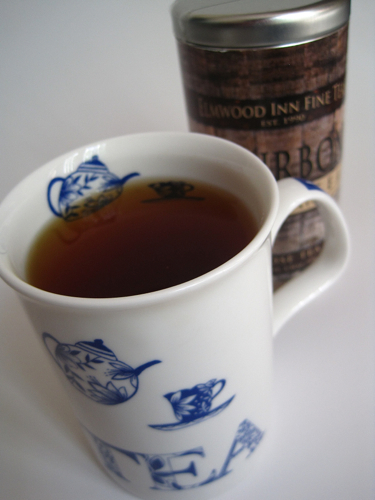 Here's what I just learned about this tea from the Elmwood Inn Fine Teas website: "The immediate notes are caramel and vanilla. 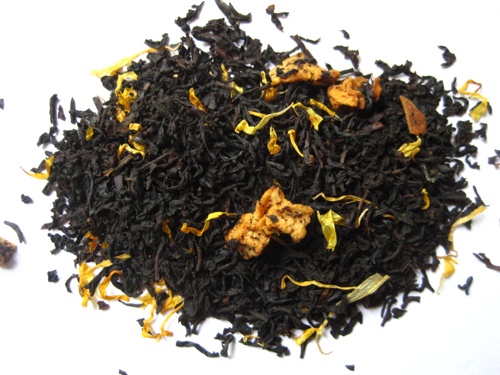 Lingering in the background is a subtle hint of char delivered by a tiny bit of Lapsang Souchong." So apparently I do like "a tiny bit" of Lapsang Souchong! 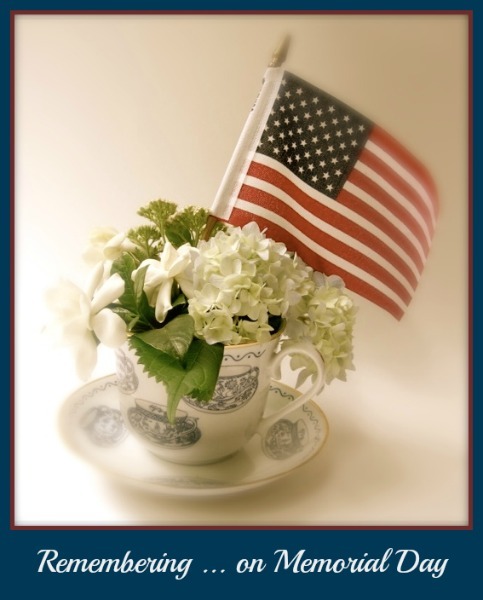 The most amazing teacup card ever. Seriously.